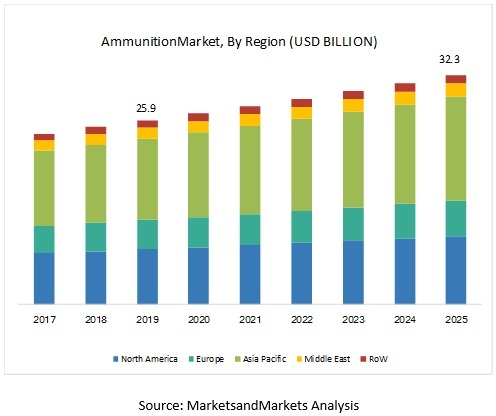 [204 Pages Report] The ammunition market is projected to grow from USD 25.9 billion in 2019 to USD 32.3 billion by 2025, at a CAGR of 3.73% from 2019 to 2025. Growing demand for ammunition due to rising instances of cross-border conflicts and increasing incidences of asymmetric warfare across the globe are expected to fuel the growth of the ammunition market across the globe. However, the proliferation of illicitly manufactured ammunition and initiation of international measures such as the Arms Trade Treaty (ATT) to regulate the cross-border trade of ammunition are expected to hinder the growth of the market during the forecast period. The defense application is projected to lead the ammunition market from 2019 to 2025. The small segment of the ammunition market is projected to grow at the highest CAGR from 2019 to 2025. The Asia Pacific ammunition market is projected to grow at the highest CAGR during the forecast period. Key players operating in the ammunition market Northrop Grumman (Orbital ATK Inc.) (US), General Dynamics Corporation (US), Olin Corporation (US), BAE Systems (UK), Nammo AS (Norway), RUAG (RUAG Ammotec) (Switzerland), Nexter (France), Vista Outdoor Inc. (US), and Rheinmetall AG (Germany), among others. In January 2019, Olin Corporation received a contract from the US Department of Defense to supply small caliber ammunition. Under this contract, the company is expected to supply 5.56mm, 7.62mm, and .50 caliber ammunition. In January 2019, BAE Systems received a contract worth USD 18 million to supply 155mm smoke and illuminating artillery rounds to the UK Ministry of Defence. In January 2019, Federal Ammunition, a brand of Vista Outdoor Inc., received a contract worth USD 41 million from the US Naval Surface Warfare Center to supply MK 318 Mod 0 carbine small rifle cartridges. What are the drivers, restraints, challenges, and opportunities that affect the dynamics of the ammunition market, and what is the subsequent market analysis of the associated trends? What are the key sustainability strategies adopted by leading players operating in the ammunition market? What are the upcoming disrupters in this market that can be potential targets for partnerships/mergers? Which geographies can be the potential revenue-generating pockets for the ammunition market? This research study on the ammunition market involved extensive use of secondary sources, directories, and databases such as D&B Hoovers, the Global Firepower, the Small Arms Survey, Bloomberg Businessweek, the US Department of Defense (DOD), and Factiva to identify and collect information relevant to the ammunition market. Primary sources included industry experts from the core and related industries as well as preferred suppliers, manufacturers, solution providers, technology developers, alliances, and organizations related to all the segments of the value chain of this industry. All primary sources were interviewed to obtain and verify critical qualitative and quantitative information as well as to assess the growth prospects of the market during the forecast period from 2019 to 2025. The share of companies in the ammunition market was determined using secondary data made available through paid and unpaid sources and by analyzing the product portfolios of major companies operating in the ammunition market. These companies were rated based on the performance and quality of their products. These data points were further validated by primary sources. Secondary sources that were referred to for this research study on the ammunition market included financial statements of companies offering ammunition and information from various trade, business, and professional associations, among others. Secondary data was collected and analyzed to arrive at the overall size of the ammunition market that was further validated by primary respondents. Extensive primary research was carried out after acquiring knowledge about the current scenario of the ammunition market through secondary research. Several primary interviews were conducted with the market experts from both, demand and supply sides across 5 major regions, namely, North America, Europe, Asia Pacific (APAC), the Middle East, and Rest of the World (RoW). This primary data was collected through questionnaires, emails, and telephonic interviews. Both, top-down and bottom-up approaches were used to estimate and validate the size of the ammunition market. Key players in the ammunition market were identified through secondary research, and their market share was determined through primary and secondary research. All possible parameters that affect the markets covered in this research study were accounted for, viewed in extensive detail, verified through primary research, and analyzed to obtain the final quantitative and qualitative data on the ammunition market. After arriving at the overall size of the ammunition market through the market size estimation process explained above, the total market was split into several segments and subsegments. The data triangulation and market breakdown procedures were implemented, wherever applicable to complete the overall market engineering process and arrive at the exact statistics for various market segments and subsegments. The data was triangulated by studying various factors and trends from both, demand and supply sides. Along with this, the market size was validated using both, top-down and bottom-up approaches. 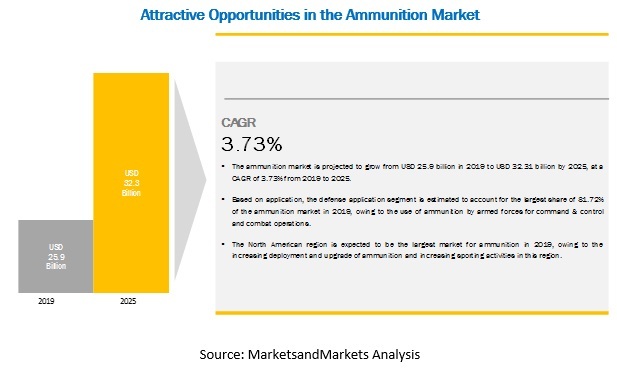 To analyze competitive developments such as contracts, agreements & partnerships, new product launches & developments, and Research & Development (R&D) activities in the ammunition market.